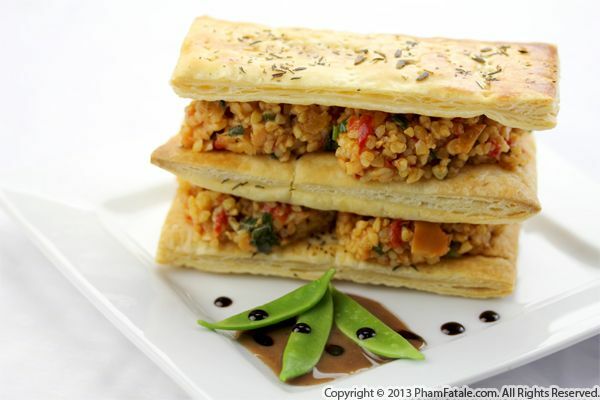 With the beautiful summery weather we're having, a refreshing savory mille-feuille that consists of bulgur is ideal to cool off. 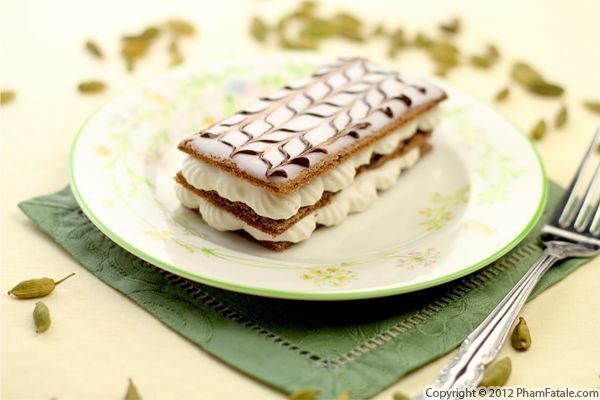 A mille-feuille in French literally translates to "thousand leaves" but in fact it's just a fancy name for layered puff pastry (the famous Napoléon). I flavored the bulgur with marinated artichokes, red, green and yellow roasted bell peppers, shiitake mushrooms and a lot of mint. The pastry layers were simply brushed with an egg wash, sprinkled with herbes de Provence and a little cheddar cheese and baked until completely puffed. I tried to create a visually appealing dish bursting with colors and invigorating flavors, and i have to say, mission accomplished. Remember, we eat with our eyes first! 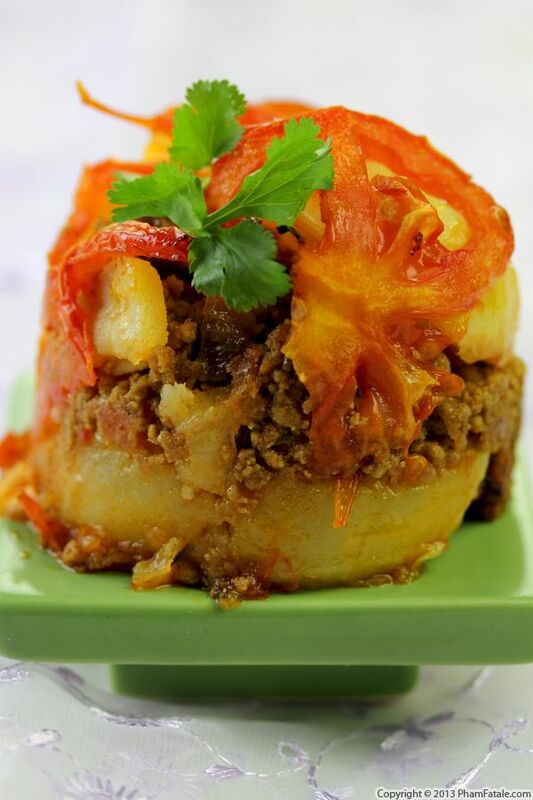 Here's a new take on a meat and potato dish. 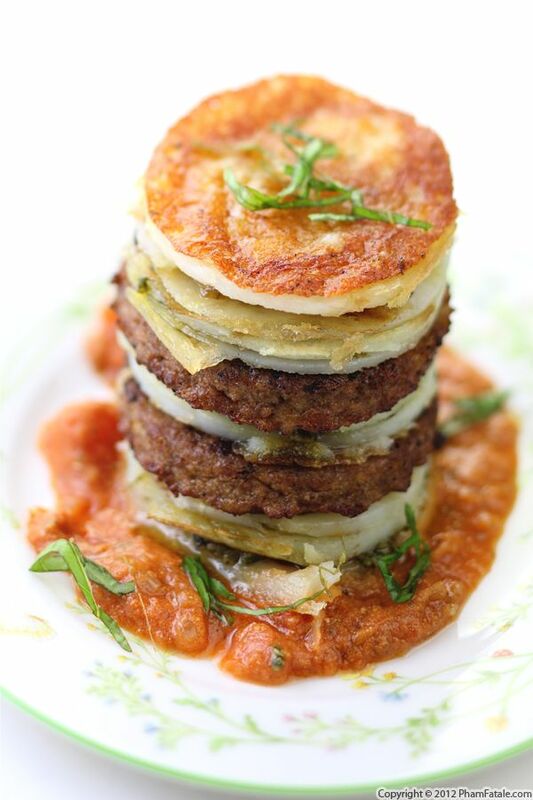 I pan-fried patties and potato slices, then stacked them into a charming presentation to create a napoléon. 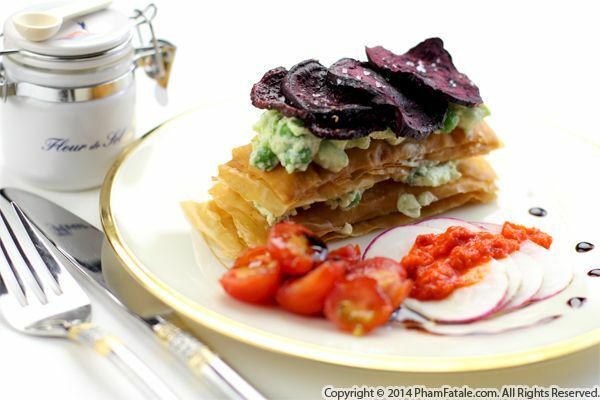 I flavored the savory napoléons with goat cheese pesto and placed them on a bed of garlic and basil tomato sauce. I think the tomato sauce helps cut the heaviness of the dish. I've started receiving photos and messages from those of you who pre-ordered my book "Haute Potato" and I'm so happy with the amazing responses I've received so far! If you're planning on cooking potato dishes for the holidays, here are some recipes from my new cookbook to consider: Cream of Rosemary Roasted Beet and Potato Soup; Pommes Château with Fried Calamari, Basil, and Tomato Cherry Relish; Timbale with Roquefort; Veal Hachis Parmentier; Pommes de Terre Rôties au Four and maybe try my family's favorite potato dessert: Lavender Peruvian Purple Potato White Chocolate Torte.